Yo ho ho me hearties ! 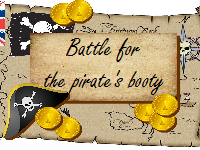 Come and prove you’re a real pirate, by entering this annual pirate contest to win the greatest pirate prize of all; ‘the pirate’s booty’ ! This kit is great fun for kids between the ages of 6 and 8. It can be run inside or outside, as long as you have enough room for the two pirate crews to complete their 4 energetic challenges. The goal of which, is to win as many gold coins as possible to win the overall contest. 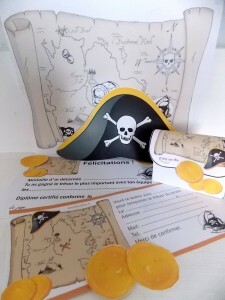 The 4 challenges are very diverse, but all centre around the world of pirates. And the finale challenge reveals a coded message to discover where their candy chests are hidden. Of course, everyone leaves with pirate hats, candy chests and certificates !